Newest articles as well as materials on Mars. Find out about mysteries, stories and convenient advice in regards to Mars. See the newest articles and publications in regards to Mars. 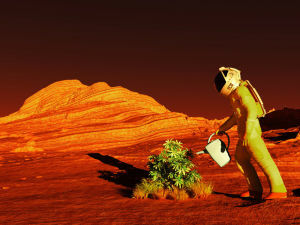 A new discovery could potentially prove that the Red Planet has life. A vast underground lake has been found in the south polar region of Mars, which has gone completely above and beyond any expectations. Up until end of July we'll be able to observe Mars's closest approach to our own planet. The Red Planet will be the brightest object in the sky, as it will be maximally close to Earth. Organic molecules have been found on the Red Planet, their origin for the moment unknown. These molecules are located in the basin of what was once a river, 3 billion years ago. This clearly shows that Mars was indeed a habitable planet. The discovery was made by representatives of the Ufology group Disclose Screen. While analyzing photos captured by the 3rd generation rover, Curiosity, they came upon something unexpected. From February 18 to March 18, Mars in Sagittarius and Neptune in Pisces form a tense configuration that could lead to heated arguments and outbursts of anger. From January 26 to March 17, Mars, which in astrology accounts for actions, drive, aggression, competition, conflicts and decision making, will be moving through the most optimistic sign - Sagittarius. The idea of life underwater may conjure up images of mermaids, underwater palaces and sea monsters in most people's minds but one expert predicts that in the future these may become a reality for new generations. From September 5 to October 22, Mars, the planet of action, ambitions and conflicts, will be traversing the territory of the sign of Virgo. Mankind's dream of finally leaving its home planet and going on an interplanetary journey is finally going to happen.